Back after a relaxed day in Jodhpur in Royal company. Had a new experience in tasting Chappan Bhog made specially by the priests invited from all over the country at the Royal Mehramgarh Fort. Weather in Jodhpur was pleasant and so were the people and their hospitality. Another secret was out yesterday. Yes, I am judging Master Chef Season 3 alongwith Chef Vikas Khanna and Chef Kunal Kapoor. Looking forward to an interesting contest and contestants. Will wait for your feedback. Also, it gives me immense pleasure to celebrate yet another milestone achieved by my restaurant The Yellow Chilli. Will be travelling to Pune tomorrow for the unveiling of a brand new and extensive Menu at TYC, Pune alongwith the launching of the International Award winning book “The Yellow Chilli Cookbook” that is a part of the grand celebrations to be held. The day will begin with an interview at Radio One, Pune after which I’ll be heading for TYC, Pune where the Press Conference including the book launch and launch of the new Menu are planned. 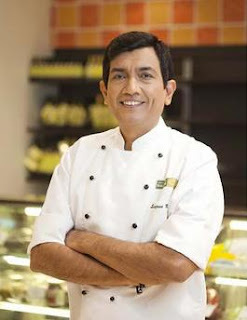 ICPL (Indian Cookery Pvt Ltd) headed by Nanette D’sa is already doing a great job in managing the TYC chain and other restaurant brands like Sura Vie in Delhi, Khazana in Dubai and Doha, Signature and Options in Dubai. We have already opened 25 outlets and would be adding substantial numbers in the coming months with many of them signed up in the recent past. It’s been a long time since the first TYC opened in 2001, and by God’s grace and continuous hardwork by my team, we have time and again proved our mettle by serving our patrons with excellent and innovative Indian cuisine. Apart from the food, the common thread that binds all the TYC restaurants is its contemporary and chic décor with exquisite elements consisting of beautiful furnishings, soft music and delicate glassware and cutlery. We had a great time in creating custom dishes for the brand new Menu that would fit perfectly to the changing tastes, keeping in mind with the tradition of not using artificial colours and preservatives and using traditional art of tandoor and slow cooking in preparing delectable dishes appealing one and all. There is a special Kids Menu as well – so the little ones can also enjoy dining out! After both the launches, there will be a cooking demonstration, and later in the day, the queen of Pune cookery contest will also be crowned which will be followed with a magnificent dinner to end the eventful day. Yesterday started with the best kept secret of recent times. Gunman involved in the 26/11, 2008 Mumbai terror attacks was finally hanged to death at the Yerawada central prison, Pune. Almost after four years, a big consolation and homage to the innocent victims, policemen and security personnel, who lost their lives during the entire unfortunate incident. Had hardly any time to rest after I missed my connecting flight from London on my way back from New York. But, back to my routine, its shoot time again – in a shoot today that’s a secret which the particular channel will reveal in a few days. I will talk about it only after that. Looking forward to bringing this new exciting show to you soon. Then it’s Sanjeev Kapoor’s Kitchen’s shoot that is scheduled to begin from today, to go on for two more days. New and exciting recipes, like always, will be presented in the most innovative way this time as well. 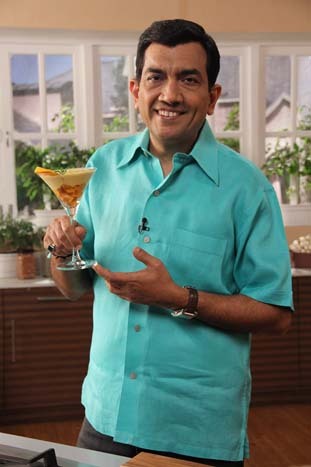 Besides this, will be flying to Jodhpur on November 25, 2012 for a book launch event. Arun Budhiraj, the inspiring driving force behind the Krishna Prerna Charitable Trust, will be launching his latest endeavor – a book called “Bhog – Temple Food of India” – along with his wife Geeta. Of what I know till now, he has travelled to several temples in India, researched the food cooked by them, and compiled it all into a beautiful Coffee Table book. The book will be launched with a very special event, a Chappan Bhog cooked by priests from legendary temples around India, with Maharaja Gaj Singh in his Jodhpur Palace. Looking forward to a Royal Treat and quite excited for this one as the theme looks great! My publishers are happy with the look of our new book “Everyday Cooking.” Encouraging feedback. “Aah Chocolate” has already gone into printing. Will hand over to you for Christmas and New Year celebrations. Are you ready? Children are the catalyst, crucial to propel any nation’s progress. Children’s day and Chacha Nehru are synonym to each other. 14th November marks the birth centenary of renowned freedom fighter who treasured children very much and it was his fond wish to celebrate and honour children. Pandit Jawaharlal Nehru was independent India’s first Prime Minister. Nehruji was a very futuristic prime minister who had the vision and foresight that children and their wellbeing should be addressed. This day celebrations will help create awareness and uplift children’s social rights too. Children’s Day festival also focuses to identify the talent, education, health, cultural, financial and social needs of children. Nehru chacha worked passionately for the child welfare issue. He sought to create responsible citizens out of young children. It was his efforts that saw fruition in terms of five years planned strategy, which would help to realize that every child in India would get the advantage of free and compulsory Primary Education. Children’s day in India is celebrated with a lot of gusto and is filled with a range of fun-filled activities at majority of schools throughout India. Even many company sponsored events and competitions are hounouring the tremendous talent that children possess. Meet a couple of promising winners with bright future. Satyam Kumar- is like any other ordinary 12-year-old, but his achievement of cracking the Indian Institute of Technology (IIT) entrance exam at this tender age is anything but ordinary. At the moment he is studying at a school in Rajasthan’s Kota. Young boy has become a ‘wonder boy’ not just for his family, but for all his peers and fellow candidates who find it tough to clear the IIT-JEE even at 19 or 20 years of age. The young boy, who comes from a modest farmer family in Bihar’s Bhojpur district, has qualified for IIT admission with an all-India rank of 8,137. Arun Kumar Yadav- If you have had a chance to see the Google search engine today you might find it interesting to know that Google has displayed a colourful and creative Doodle 4 Google India 2012 on its homepage created by Arun Kumar Yadav, a studentof class 9 KendriyaVidyalaya, Chandigarh. This award winning unique creativity just leaves you in awe of the artistic stroke this kid possesses. Celebrating their success and hopefully this should inspire the best in your own children; spend some quality time with your children today and dish out these recipe suggestions together and make a memorable day out of it. Happy Children Day!! Children are special and it goes without saying that it is the finest phase where life is enjoyed to the fullest. Children are so precious and go about life, unbothered and being merry in their own world. In India Children’s Day is celebrated on 14th November while the Universal Children’s Day is witnessed on 20th November. The great legend and persona, Jawaharlal Nehru was one of the most eminent figures who fought persistently for India’s independence. Nehruji was called Chacha Nehru by children who adored and admired him. Nehruji’s birthday is on 14th November to honour and to acknowledge his contribution and involvement in Children welfare; Nehruji’s birth anniversary is remembered as Bal Diwas or Children’s day. This day all institutions or schools pay homage via various programs organized for children to salute Chacha Nehru’s lifelong passion for the development of young people or children. Understanding the true essence of Children’s Day that is very relevant today is important. The core values and vital disciplines learned as a child are responsible for shaping the kind of adulthood one has. It is the main duty of parents, teachers and elders to teach their child the value of sharing with those who are not so fortunate then not only can a child grow into a responsible human being. We cannot hide the fact that a large number of children in India are not getting basic privilege like health care, sanitation and education. Many children are compelled in to child labour for earning money instead of playing. Here’s an idea that can be you fun-filled activity to celebrate this children’s day with your own children as well as support a worthy cause. Prepare these delicious recipe suggestions given with your own children. Enjoy the quality time, good food and then prepare some more and share it with few underprivileged kids in your own area or locality where you stay. Children’s Day special recipes,which are deliciously different with the aim to make a difference. Try Today! Happy Children’s Day! Vibrant Diwali festival is full of sparkling colour’s, which celebrates life and family. Five days of sheer bliss and alluring aromatic indulgences with near and dear ones. The first day Dhanteras celebrations are followed by Narak-Chaturdarshi or Chhoti Diwali hullaballoo. On this particular day, people make it a point to get up early and each member of the family is expected to have an early tailabhyangam (oil-bath) and later this is followed-up by aromatic uptan application to cleanse the body and calm the soul with herbs (like turmeric) that are scented with essential oils. In the good-old-days, matriarch of the household was in command and demanded each member to finish the elaborate bathing ritual and dress up in their new clothes bright and early. Once ready post-bath; the womenfolk of the household decorated the courtyards with rangoli’s (drawing traditional motifs with colorful powders.) Now, they have that the festive stage is set and traditional puja thali decorated and lit; worship of Lord Krishna’s victory over evil wicked demon king Narakasur ensues. Post puja the sweet and savoury indulgences start. Legend of Narak-Chaturdashi- The second day of Diwali is dedicated to the victory of Lord Krishna over the wicked demon king Narakasur. Narakasura was the son of Bhoomi God and despite of the righteous parentage, he possessed devilish tendencies. Ancient scriptures have it that Naraka after a severe penance had acquired immense powers due to a blessing given by Lord Brahma. Under his rule everyone suffered a lot of hardship and torture. Also, Narakasura attacked the heavens and got hold of the army of elephants of Lord Indra. In his arrogance he even snatched away the splendid earrings of Mother Goddess Aditi who was a relative of Lord Krishna’s wife, Satyabhama. Narakasur imprisoned sixteen thousand daughters of Gods and saints of marriageable age in his harem, and intended to marry them. This created chaos everywhere. When Lord Krishna learnt about Narakasur’s evil deeds, he decided to destroy him. On hearing this Satyabhama, Lord Krishna’s wife, took this task upon herself and with his help killed the demon in the early hours of the fourteenth day of the dark half of Ashvin. The women imprisoned by the demon were liberated. As a symbol of the victory Lord Krishna smeared his own forehead with the demon’s blood. On his return, the womenfolk massaged his body with scented oils and gave him a good bath to wash away the filth. Since, then the custom of taking a bath before sunrise on this day has become a traditional practice. In South India before sunrise people break a bitter fruit that represents the head of the demon king that was smashed by Lord Krishna and apply a mixture of kumkum (a red powder applied on foreheads generally by women) and oil on their foreheads; to re-live the glorious victory of good over evil. They then have an oil bath using sandalwood paste. After Narak-Chaturdashi, Laxmipujan is performed on the third day of Diwali. As the story goes on this particular day Goddess Laxmi emerged from the ocean of milk called the ksheersagar. She carried with her wealth and prosperity blessings for mankind. This emergence of Goddess Laxmi is celebrated with great splendor and grandeur. A lot of people believe that the Goddess of prosperity and good fortune visits the homes of devotees on this day after sunset. Hence, they perform the puja at the stroke of midnight! For the following alluring aromatic Diwali delights, there would be no need to burn the mid night oil. Try out the dishy dishes! Blogger’s meet, a grand success! Finally it was the unification of enthusiastic food bloggers from Mumbai under one roof yesterday, and I must say it was as exhilarating as it could be! 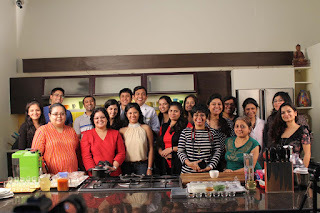 It was an absolute pleasure for me to host the Food Blogger’s Meet organized by my dear friend and famous food writer and blogger Rushina Munshaw Ghildiyal. The meeting was power packed with exciting interactions with the bloggers and demonstrations by the passionate foodies who cooked deliciously super dishes like Wild Mushroom Risotto Golgappa with Tomato Basil Shots, Smoked Galouti Golgappa with Lemon Mint Lassi and Motichoor Golgappa with Espresso Shots. Soon after, a hearty buffet was awaiting us! My team had put up a great show in arranging the lunch for all our eminent guests at the meet. It included dishes like Thalipeeth with Kharda, Chicken Tikka Pita, Paneer Tikka Pita and American Corn Sev Puri in starters, Veg and Non-Veg Kulhad Biryani with Mirchi ka Salan and Burani; andBrown Rice with Lalla Mussa Dal in maincourse and Motichoor Golgappa with Espresso Shots and Jamun Bhapa Doi in desserts. Commonly known as the festival of lights, Diwali has lost its true sheen and real meaning, along the way. The core meaning of it is triumph of good over evil. Deepawali or Diwali means the victory of righteousness by defeating the spiritual darkness. The bigger take away lesson in it would be being virtuous and doing good by defeating the evil or negatives we all have within our own selves. 5 Day Diwali celebrations in India are popularly celebrated by Hindus, Sikhs and Jains. In the northern regions of India, the Diwali celebration is associated with return of Lord Rama to Ayodha after defeating demon Ravana. In the Southern regions of India, Diwali commemorates the triumph of Lord Krishna over wicked – Narakasura. To the Jain population, Diwali is celebrated to mark the spiritual triumph of Lord Mahavera who attained Nirvana. People start Diwali preparations in advance and it beings with cleaning and decorating their household’s weeks in advance. It is believed Goddess of wealth likes cleanliness and roams the earth on festive days and enters only those households that are neat, clean and very well illuminated. Thus every household does their best to clean the house top to bottom and decorate it with flowers and rainbow coloured rangolis. Marigold flower torans adorn the main gate of most homes and lit-diyas are generally placed uniformly on each side of the main door, to attract wealth and prosperity. First day of Diwali – Dhanteras: On this day Goddess Lakshmi who is the goddess of wealth and prosperity is worshiped. A very famous story connected to Dhanteras – once there was this King called Hima who was destined to die young by a snakebite. However, his wife saved his life. The day he was destined to die, Hima’s wife did not allow him to sleep and she blocked his room by heaps of gold ornaments. She lit a million diyas all around the house and inside his room such that bright lights dazzled reflecting more light of the gold ornaments as well. Yama – the God of death came disguised as a serpent to take Hima’s life but the brightness of diyas and the dazzle of the gold ornaments prevented Yama from entering the room. He fell asleep outside and in the morning left, sparing King Hima’s life. In remembrance of this story, people pay their homage to Yama on Dhanteras which is also known as Yamadeepdaan.